Charming country house in the hills of the Val di Cecina. 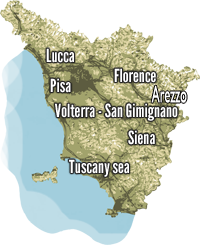 The farm enjoys a magnificent view over the valley from Volterra leads to the Etruscan Coast. The cottage was renovated in the tradition of the Tuscan materials. It has 6 apartments are well furnished and all with private outdoor area for outdoor dining, wi-fi in all apartments. In total 18 people can be accommodated max +6. The pool is large and well positioned within a large, well-kept garden. Our guests can take advantage of an’area relaxation with fitness room, jacuzzi and turkish bath to use privately and upon request. The owners are present on the farm and will advise on the many activities that are organized, from hiking, visiting local museums and charming Tuscan villages nearby. The passion and care with which you occupy the farm can be seen in every detail. The nearest village is Montecatini Val di Cecina, with services and restaurants of all kinds. MT1122 Double First floor with private bathroom, heating, satellite TV, safe, internet connection. If necessary, you can add it to the adjacent apartment making it this a three-bedroom, two bathrooms. MT1122-1/2: Bilocale 2 +2 persons (approx. 40 sqm) on the ground floor with private entrance and private outdoor space with tables and chairs. Kitchen-living room with sofa bed, double bedroom and bathroom with shower. Inside: 4 burner stove, refrigerator, dishwasher, microwave oven + grill, toaster, coffee maker, coffee maker, dishes. LCD TV, DVD player, safe deposit box, internet connection, satellite and terrestrial TV, heating. MT1122-3: Deluxe Bilocale 2 +2 people (50sqm) on the first floor, with a balcony and panoramic views. Large kitchen-living room with sofa bed and which leads to the balcony, large double bedroom, bathroom with shower. Within 4 burner stove, refrigerator, dishwasher, microwave oven + grill, toaster, coffee maker, coffee maker, dishes. LCD TV, DVD player, safe deposit box, internet connection, satellite and terrestrial TV, heating. LCD TV, DVD player, safe deposit box, internet connection, satellite and terrestrial TV, heating. MT1122-4/5: Trilocale 4 +2 people (about 50 or 65 square meters) on the ground floor or first floor with private entrance and private outdoor space with tables and chairs. Kitchen-living room with sofa bed, 2 double bedrooms (one of the two rooms that can be can have 2 single beds), 1 or 2 bathrooms with shower. Inside: 4 burner stove, refrigerator, dishwasher, microwave oven + grill, toaster, coffee maker, coffee maker, dishes.